RISE IS PROUD TO SELECTIVELY PROMOTE AWARENESS OF LEARNING DIFFERENTLY THROUGH SUPPORTING CREATIVE AND WELL EXECUTED FILMS, BOOKS AND PROJECTS. Executive Producers of Embracing Dyslexia. This is a thoughtful and moving exploration of dyslexia from an insider’s perspective, weaving together interviews with parents, adult dyslexics, researchers, educators and experts to provide an accurate portrayal of a learning difference that affects between 15-20% of the population. Parents share emotional stories of their frustration over failing to understand why their children were struggling with reading, writing, and spelling and the life-altering impact the word dyslexia had on their lives. Adult dyslexics courageously open up and speak candidly about their dyslexia, sharing their struggles and successes they had in school and in their adult lives. 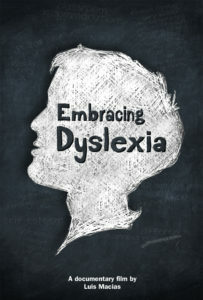 Experts and educators define what dyslexia is and illustrate why early dyslexia screening for all children is vital. They also share how effective tutoring, classroom accommodations, and recognizing and fostering the natural gifts and abilities of a child with dyslexia can take them from feeling stupid and experiencing failure on a daily basis to believing in themselves and knowing that they can be successful. Supporter of Wizard Mode by Salazar This film is a story of Robert Gagno as he rises up the ranks of the international pinball circuit while striving to gain his independence and transcend the label of autism. Supporter of UNSPOKEN based on Emma, an Autistic teenager living in NYC who is described as a vibrant, brilliant young woman. This film will show perseverance and hope, as well serving as a crucial reminder that things aren’t always as they seem: snap judgments hold us back from the possibility of many meaningful connections. C0 Producers of Little Hero which is a documentary that centers on the relationship between six-year-old twins, Avery and Xander. At 18-months-old, Xander began to display typical signs of Autism and was subsequently diagnosed with Autism Spectrum Disorder. Avery, however, does not view her brother as being a special needs child. Instead, she actually sees him as a superhero. Little Hero was screened at the 2015 Big Sky Documentary Film Festival and the New Orleans Film Festival.